Tomorrow I will share with you the gloves I buy every September when I’m in Paris. They’re thin, sturdy, and age beautifully; a street photographer’s dream. P.S. My assistant Emilie just found out they would cost $100 to mend!! They barely cost $100! Anyone know a good mending specialist? Ugh Sart — these are rich people problems. I usually like you but this post makes me want to barf. Maybe keep the gift guide on the positive side? ummm. yeah. Coats & Clark and a sewing needle. turn those bad boys inside out. gingerly run stitches a through the tear run. do that a couple of times and be sure to knot securely but gently so as not to gather the knit. check youtube on how to mend a sweater. $100 to mend?! Ridiculous. Particularlt if it’s just the seams splitting. That’s 10 minutes of work – plus you could do it yourself easily. Where are you now? Patis or New York? My tip would be to find a knitting shop asap and just ask one of the nice ladies hanging out in them to teach/show you how to do that. Buy them a coffee or a nice ball of yarn and they will probably do this for you, with pleasure. biking is hard on glove. 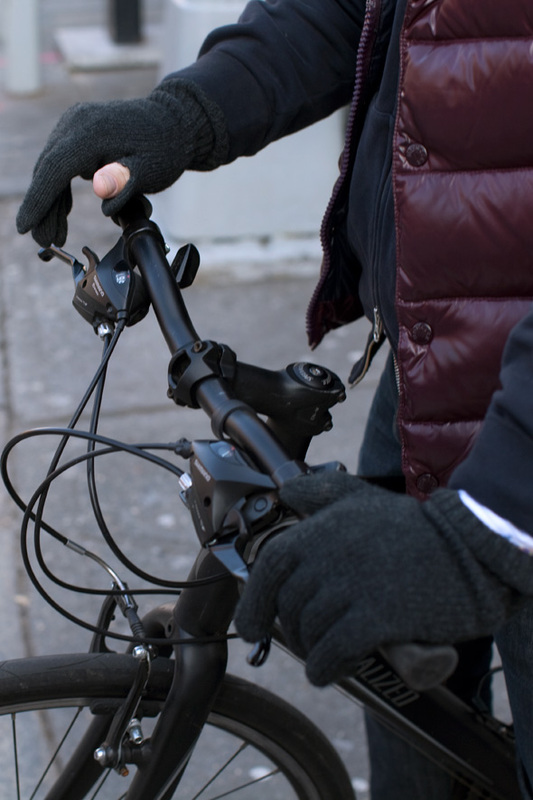 my leather gloves are all stretched out of shape from holding the handles… I have bike-gloves and non-bike-gloves. Hah! That`s funny! I really love a good quality leather gloves, that feel like your second skin! It`s worth to invest in a nice pair you can keep for years! Oh come on!! My grandma would mend them in 10 minutes for 0 euros and you wouldn’t even see a stitch! You need some HAND-KNIT gloves. If they fall apart, it’s easy to rip back a finger and re-knit. If you find a fast enough knitter, they’ll also be less than $100. Cashmere is a very delicate fiber, you are better off buying wool for durability. Ask a local knitter to mend your glove. Neyin kafasını yaşıyon abicim sen ya? 100 dolar diyo. I repair knitted garments. please contact me at your convenience. Thank you. Or maybe buy leather gloves lined with cashmere! $100 to mend a small hole in a knit glove!? That’s insane. It would be cheaper and more rewarding to learn how to knit and do it yourself. Seriously, swing by your local yarn store and see if they can recommend someone who would be willing to help you out. The hardest part will be finding an acceptable match to the yarn. Knit gloves really are beautiful! Seems like she’s perfect with the home-spun tools. Based upon her tutorial and visuals might be worth a shot to drop her an email. With her not being too far away – Michigan – it might be less than the $100 quote. Do you know anyone that knits? Fixing a finger is pretty simple for an experienced knitter. Gee, I wish I can mend it for you, but I live 1,000 miles away. I knit them for my own pleasure. Some people just born craftist. um…well … i’d just sew them up! egg (hard-boiled is best) to sew ‘against’. I am loving my fingerless cashmere gloves from J. Crew. Haven’t had any problems with them at all. Oh, I love knit gloves. Mend it yourself! I was doing just that yesterday to my favorite pair of wool gloves. I agree that you just need to learn to knit. I knit all of my accessories and sweaters in fact (and they are beautiful…not at all unstylish…there are great luxury yarns available these days). The added bonus is that they weren’t made in a factory in China, etc. and shipped thousands of miles! $100 to mend?! that’s not even funny NY. I read from previous blogs of yours, that people simply do not fix or repair damaged items, but rather purchase new ones. I really really like that you are interested in saving the life of your items! It inspires me to repair my goods rather than give myself an excuse to purchase new ones. My local dry cleaner (who also does repairs), and I thank you. Well, leather gloves are an option but it is essential to get them to cover the wrist and beyond. I have wool gloves which are strong and bobble resistant as well – they also hold their shape. Cashmere gloves and cashmere socks are a fabulous idea but a truly lousy reality unless you’re the Great Gatsby! Send them my way! No charge. I’m an excellent and experienced mender (unless you mean your leather gloves) I’ll mend them for free – or for a few style tips. Cashmere lined sports gloves if your constantly on a biker and a dressier pair for date night!! For darning of wool gloves, the tailor at Jerri’s Cleaners, on 6th Avenue, between 10th and 11th Streets. For leather, the shoemaker across 6th Avenue on 10th Street. Give the money you save to the guy who begs outside Citarella. Best practical gloves for being out and about? Wind proof gloves made for runners and cyclists. Try Smartwool, Under Armor, Mountain Hard Wear, or other outdoorsy brands like them. They keep your hands warm and dry, are fully functional, and have a nice tight fit (not bulky.) I have a dog, so I need to have warm hands when I walk him in the winter. Knit gloves just do not fit the bill for me. Also, you can get these gloves in solid black. They don’t look like you have ski gloves on. Brooks Bros – still? I don’t know. A new bike! Looks like a Specialized hybrid in matte black. Ride safe! Weeeeel, this place *will* charge you, um, alot?….Alice Zotta – 2 W 45th…but those reweavers are like magicians, I swear. Those are fabulous. Cashmere is king! They keep hands warm and styled in the gnarliest weather. Oh dear, first world problems. I haven’t mastered invisible mending yet, but I’ve gotten pretty good at not noticeable fixing. And I don’t knit & have never formally studied sewing–mending is, I think, just one of those skills that can be developed with some patience, practice, and logical problem-solving skills. No fancy tools need be involved, either–a decent needle, something to stabilize the fabric, and doubled thread will generally get the job done. So this is something you can do yourself. last year, I strategically snipped mine on purpose in one place just to poke a fingertip out use my android! this year, I found & bought a fully technical type of gloves. also I now need ones that grip everything and they keep my hands clean, dry & safe. so, function over softness. I just can’t use the knit ones anymore. I staple clothing if I get stuck, also a bit of tape does wonders but it tends to make a squishy noise if you use it on the hem of a skirt. I think it would look pretty daggy to wear the gloves so that all the fingers were hanging out, how to draw people’s attention in … nothing like a bit of de-construction to pull it all together. Mend? As if? Give them to someone poor or homeless and buy a new pair. Yes, I know of one, but he is in Hong Kong. A 70 old man who does it on the street for the pass 40 years. He is the best and inexpensive, I send all my sweaters there and coming back looking like nothing had happened. and why keep buying gloves that don’t work? it seems a waste of money and material. cashmere is too delicate for gloves, expecially when you bike a lot. this might be an interesting link for anyone who likes to think about what they actually buy… cashmere is not particularly animal-friendly. I like the ones without the finger tips. You can still take photos and keep your hands warm. When it comes to gloves, mitts and socks, cashmere is not strong enough! You need a wool and nylon mix or else it’s just a waste of money. Besides, mittens are much warmer and more stylish;) Take it from a Norwegian! I can mend them beautifully to you, just send them to Brazil (laughs). I usually cut my gloves in the manner of this photo so I can use my iPhone. Is that not what is happening here? When are you coming to Barcelona to shoot pretty people in the streets,like me? 1) In our society where everything is disposable, you can’t have anything mended anymore. Gants Causse, 12 rue de Castiglione, 1st arrondissement. A wonderful store that sells traditionally made quality gloves. And, of course, if you have the money : Hermès. I suggest you find that laundress and have them mend them! Or take them to a yarn shop and ask the proprietor if she knows someone adept at those things. And trust me, if you walk into one of those yarn stores, you will not walk out without a few photos! They are a wonder of color! We cannot live without our cashmere gloves during the winter months!! DIY. It’s easy to learn how to do and then you have something to be proud of when you’re done. Or pay your assistant to do it. OR ..um…….you could get a needle and thread from CVS and mend it yourself. (NB: Google methods of mending cashmere…its quite simple, yet brilliant really!). On another note I gave up on gloves a long time ago. My long fingers seem to ignore their purpose. So mittens are my saviour. Nowadays there is a mit/glove hybrid (these are basically mittens that have the tips folding over to reveal fingerless gloves). They are quite stylish/hip and for a photographer c’est superb. I swear by these Barbour lambswool fingerless gloves for doing anything outdoors that requires a little dexterity from your hands (ie Photography). Even though the fingertips are exposed they’re extra thick and very warm so my fingers never get too cold. I have had mine for over two years and wear them heavily during the fall and winter and they still look brand new. The Gap has a couple pairs of knit gloves right now with a slit at just the tip of the thumb and index finger where fingers can slide out to flick a lighter, bike bell or operate a smart phone. They’re inexpensive, but may be just what you’re looking for. See—I’d be a perfect as your personal assistant. I mailed you my cover letter and résumé last night. Check it out. You need to be friends with a knitter. He or she would have you recognizing a hand knit from a machine knit in no time (as a bonus to the knitting readers of your blog). You know there are mittens that are fashioned in such a way that the top is a flap that opens up and buttons down so your fingers are exposed when you need them to be. Perfect for photographers! May I suggest putting a call into the Purl SoHo knitting shop over on Broome. It’s a modern knitters haven…I imagine they might know a great knitter who might enjoy the challenge for less $$$. Resourcefulness! Not that you need any further advice, but yes, a darning needle and some wool (preferably some that doesn’t match at all). Turn the glove inside out, darn them (easy), turn them right side out. 10 minutes. OR, cut all the fingers off half-way down and let them be finger-less gloves! Much easier to manage anyway. This happens with my alpaca socks which I love and keep mending and mending and mending but they are mainly all holes now. Solution!!! I just discovered New Zealand merino and possum fur (really!) socks… they have knit gloves too… and just ordered them. Supposed to be really really warm and soft and durable. These possums have beautiful fur but are destroying the NZ forest so I don’t feel bad about using their fur. you can google new zealand merino possum and find sites that sell. Plus I like to purchase stuff from real people not big corps and these are mostly small business people. If you can afford $100 knit gloves, you should definitely be retired. Alice Zotta Reweaver does amazing work. So what are the gloves you buy every September in Paris? The knit gloves are machine made with — well not the best cashmere out there. The mending must be done by hand. Find a wonderful knitter, pay him or her what they are worth, and have them knit you custom fitted cashmere gloves. They will last because the cashmere will be better and they will fit properly. And I the mending will be much less expensive. Having read the other comments — of course wear cashmere gloves. A cashmere scarf and beret are nice too. And not so expensive. Just learn to knit. Just accept the rule of thumb! btw, did you ever/consider soc. echo-touchgloves ? may i, as a/my personal side-note ? 15+ years ago i bought Roeckl-gloves in Munich, and they travelled around-with-me-thru-france-italy-usa. now that i needed to wear them/again, a button “went missing”. i found out that Roeckl-HQ has a free-of-charge-mending-service – i sent my worn-gloves and got them back mended/repaired. So, which are the beautiful gloves you buy in Paris, Scott? I’m on the search for a great pair! Scott, If I lived in NYC I’d mend them for you for nothing. Would take a few minutes at most. Seasons Greetings from warm sunny Australia! Awwww, just leave the torn thumb. Just think: now you don’t have to remove the gloves in order to use an iPhone! Good people who don’t overcharge are so hard to find! But I have to say that the combo biking and knitted gloves is not a good combo. As born and raised in a country with a strong biking culture – Denmark – I and my kids always get holes on the gloves/mittens on the tumb – so the onlys way is to do the mending og swift to leather ones. Cycling stresses the fingertips – it’s gonna happen. Either get some winter cycling gloves or fingerless and/or ‘claw’ style military surplus ones – they work really well. Stomp and steer! I love cashmere, too! I have two beautiful cashmere scarves which I recently purchased, but unfortunately they are constantly developing little holes in the knitting. 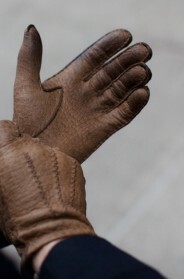 As far as gloves, I would recommend a leather pair lined with cashmere knit. I have a pair, and they are AMAZING. So warm and fuzzy inside. Since you’ve mentioned liking sporty gear as a fashion statement, I recommend neoprene kayaking gloves for cycling. Mine are neoprene on top and suede on the under side. Wind-proof and durable, maybe even stylish. And not expensive. Try REI. There’s just a nice shop right at my street which would do it for 10 € or even less and you would proably not notice the seams. In this shop I let my trousers fit and cut to my body. And even for this I don’t pay that much! You or your friend have – for sure – asked the wrong people! Second: If you use these gloves for biking… maybe you should think about buying some real good sport biking gloves, finger gloved. They would endure your city-biking for 5 years or even more! Optionally go for leather gloves with fur or cashmere inside, they are more enduring, comfortable and very elegant! Keep on photographing. Most of your pictures are very inspirational! Thank you! I would also make fingerless gloves! Most of the comments are from non-knitters. I have been knitting for 30 years and though I knit medium fast, I still hate to repair knits, especially socks and gloves. Because of the fingers knitting a pair of gloves takes more time than knitting a pair of socks which takes on average 450-500 yards of wool. I can easily knit a scarf or a hat in one evening but a pair of socks will take two days. Suppose you knit 100 yards/ hour it will take you five hours but with gloves and socks the needles and stitches have to be very small (on a set of 4-5 needles size 0-2 or 1-2 long circular ones) to be long wearing. So it’s like driving through New York at rush hour. Non-knitters think of knitters as retired lady of leisure and people who sit in shops and want to kill their time being good samaritans, but if you take 2 days to knit as for living how much would you think you charge, seriously considering that you need to be able to cover insurance when sick etc… This is no wonder that most things nowadays are machine made at lower quality. Those who question this just stop in a yarn shop get a ball of yarn and needles size 8 and try to see how long it will take you to knit this. Then think about switching to 4 or 5 size 0-2 needles and estimate how long it will take multiply by five. Besides, cashmere pills like crazy and is never considered as a yarn for daily work, such as around bike handles. please – still waiting for which gloves are bought every Sept. in Paris? My mom will make you a couple of new one…..for free…..
Oh Scott, you are riding a Specialized?!?! And it’s a hybrid at that, such a disappointment for a man who prides himself on having style and a taste for the finer things. Now look at your post directly above this one “On the Road…..Palmeraie, Skoura, Morocco” and notice the lovely mixte this gentleman has. Note the delicate twin top tubes, the way the brake cable is hidden inside the top tube, the gentle rake of the forks with chrome tips, and that lovely sea foam green. I’m not expert enough to say what vintage this bike is, but I can tell you despite being found on some dusty street in Morocco it has more heart and style than your boring mass marketed Specialized. I think that’s deliberate and functional- he needs to operate his Blackberry! Clever! I agree with many of the comments above. It should not cost $100 to mend knitted gloves. My question is why do these gloves have a seam at all? It may be my personal preference, but as a knitter, I would never knit gloves (mittens, socks, hats, nor pullovers) with a seam. Dude. You sent an assistant to see how much it would cost to mend your gloves? Just use a needle + thread. I’ve never had a pair of knit gloves split like that, they last yonks! And I am a cyclist. Perhaps you should try the cheaper end of the market, like moi. Sorry but what a ridiculous post! Every year I buy a pair of black gloves for three quid at Camden Market and they do nicely, thank you very much. I always manage to lose them so £100 would be such a waste. How about giving £97 to the homeless? Save all of them and make a pillow of gloves. My mother still has gloves from the 50′s that we wear constantly – never mended. Unfortunately, you are being sold shabby gloves, my friend, no matter what the tag says. I suggest that you demand a refund, then rediscover the beauty of ye olde American work gloves – Carhart / Wells Lamont – and consider it the macho “utilitarian touch” to your gourmet wardrobe… the essential “wrong thing” as Vreeland would say. Before you complain about mending costs, consider the expertise and learning curve it takes to be a good mender. A high price may indicate an undesirable job, the kind that involves a lot of time and skill but no particular satisfaction. Seams on knitted gloves indicate cheap assembly techniques, usually cheaper fibers as well. If one finger goes another one is about to go. I’m a lifelong knitter and love to mend fine things made of beautiful fibers but I don’t bother when they’re cheapo items carelessly made. I have learned in Ohio winters that leather gloves with warm linings are more versatile than knitted ones if you need to grip metal (as in steering wheel or bike handles); the leather palm keeps your hand from slipping. If you aren’t handling metal, mitten designs are warmer as the fingers stay together. Forgive me if I go on–knitting is a fiber technique; the yarn of alpacas, lambs, sheep, NZ possums, et al, has variable qualities. A blend of fine merino sheep wool with nylon is very strong, soft, and versatile; well made gloves out of any high quality yarns and blends will be expensive. They should last several years and deserve attentive cleaning, usually not dry cleaning but gentle washing and air drying. Splitting is an issue of fit, they are too tight. I knit custom fit gloves. You can contact me at my email address. I charge just a bit more than what the mending fee would be. Some reasons for its high quality are due to the climate these Mongolian goats’ lives in. The variety of plants, the severity of the winter climate and the breeding, all contribute to the softness, warmness and fineness of pure Mongolian cashmere wool.